A particularly attractive tree, the Voss's Laburnum tree (Laburnum x waterii 'Vossii') is noted for its long beautiful golden-yellow flowers. Commonly seen planted close to lakes and rivers where its somewhat rambling nature is very visible. Springtime marks the arrival of furry young shoots and dark green leaves as well as the formation of pea-pod type flowers, which can reach lengths of 30cm (24in). Please note the seeds are poisonous. A good tree for a small garden as this tree can be expected to reach a height of around 4m at ten years but could go on to double that depending on local conditions. 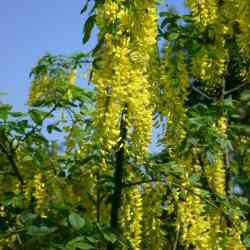 Voss's Laburnum is supplied at a height of between 1.2m and 2.40m in a 5-12L container, which means that the tree has a well-established root system and can be planted any time of the year and with better results than either bare-root or rootballed trees. We have asked all our Laburnum trees to be exceptionally well behaved and to flower in the same year as delivery. Several factors will determine your Laburnum flower viewing pleasure e.g. If you order it after the flowering season, it is most unlikely it will give you a repeat performance regardless of how long and loud you shout "ENCORE!" at it. If the weather is not that great, the official Laburnum Flowering Union may call a strike and prevent all flowers from coming out. As we have demonstrated, some factors are out of our control but usually the Laburnum Tree will provide a lovely display of flowers provided the conditions are right and you are there long enough to see them. The 1/4 and 1/2 standard reference describes roughly how much clear stem there is of the tree in relation to its overall height. So a 1/4 standard Vossii will have less clear stem than the same height 1/2 standard.